Situated between the highway and traintracks, and bisected by the Maas river, the Maasterras is a large urban area soon to be developed by the city of Dordrecht and Zwijndrecht. Except was commissioned to develop a visionary document for this area to help policymakers, developers and investors alike to see the benefits of sustainable development for this area. The result was a booklet that related to the already existing structural vision booklet, and gave the city council a tool to develop the vision further during its 15 year development tract. A three-tier scale structure, consisting of Policy, Planning and Architecture, has been combined with the three focus areas of the area; Smart, Business and Dynamic. Together they form a structure of approach that allows innovations to be applied in an intregrated whole, acting on multiple scale levels and areas of application. 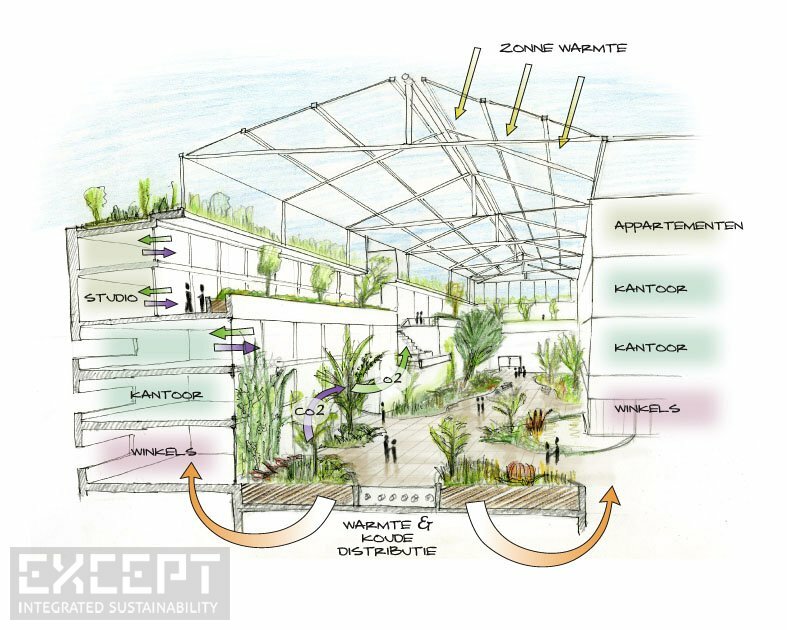 The separation between goals and means help the various parties gain insight into the different ways their contribution could help the overall project, and how it relates to the way the city can become sustainable. Using solutions that function on various levels at once, every addition to the project becomes more efficient. Smart systems adapt themselves to future changes in demography, society, technology and markets, and use the strength of ecological systems to work for us. Buildings and spaces that adapt to rapid changes in market demand, and save energy and resources while doing so is the core focus. Lower health related costs for business owners and excellent multi-modal transportation options make the area highly attractive to small and medium businesses. A city that can change over time, and allows the dynamics of people to manifest itself in the direct environment is the objective. Using the river water as a landscape and ecological element saves resources and increases value, while shaping an attractive district. The booklet is easy to read and accessible. 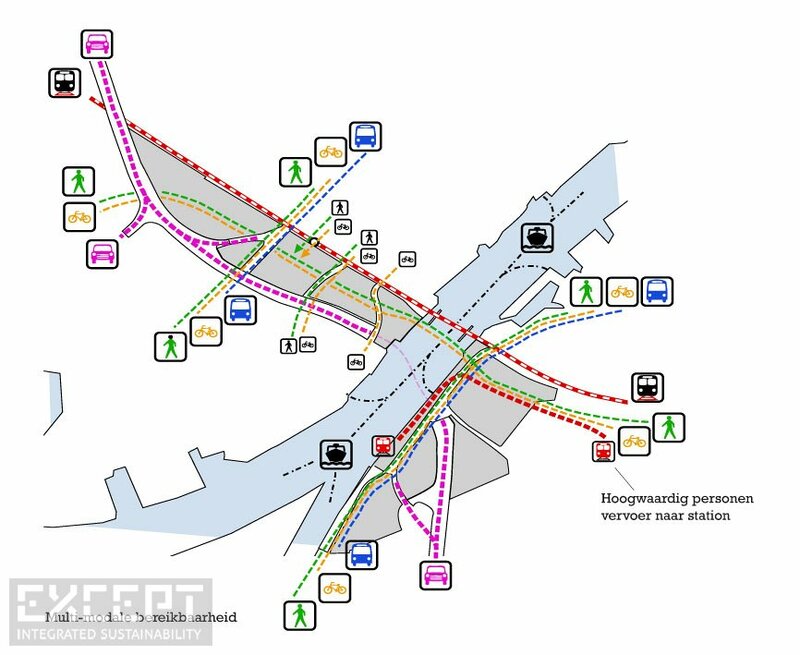 A coherent overview of the possibilities of a sustainable region is supported using real world examples, images and diagrams alongside the innovative concepts presented. Suggested methods include decentralized energy, water and wastefacilities, urban recycling, adaptive re-use, smart roads & buildings, integrated regional planning, waste-heat use, phytoremediation & stormwater treatment, and many more. The booklet was offset printed on FSC paper, using strictly ecologically degradable inks and a minimum of waste. 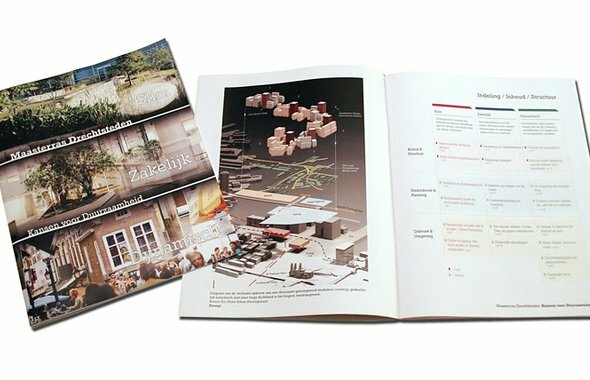 The booklet joins an existing urban study by Zandbelt & van den Berg. The first 5 pages of the document can be downloaded here.